Halcyon is the fairy-tale bird goddess from Greek mythology. She had the ability to bring calmness to stormy seas. In popular literature, halcyon has a strong connection to serenity, peace, and prosperity. However, in a darker corner, Halcion is a brand name drug. It uses benzodiazepine as its active ingredient. It is a sedative and tranquilizer prescribed to treat insomnia. Like other sedatives, Halcion withdrawal can result in when you stop taking it. There are some difference between these types of benzos. First, it is in how fast-acting they are. Then, it is how long they last. Lastly, it is how quickly they leave the body. The shorter-acting the compound, the more intense the effect. Therefore, the more acute the withdrawal symptoms are. Different forms of benzos work to treat different symptoms. They ranging from panic attacks to psychotic mania. In addition, people commonly use them to sedate patients undergoing surgery. Benzos work by stimulating receptors in the brain. Then, they respond to gamma amino butyric acid (GABA). This neurotransmitter inhibits neural activity. It slows down the brain and the central nervous system (CNS). This, in turn, causes the user to experience a sense of relaxation and he or she may start to feel sleepy or drowsy. When a benzodiazepine is present in the body, the CNS adapts to this new mix of chemicals. Then, it tries to maintain some sort of homeostasis. Homeostasis is the delicate balance of chemical processes. In fact, the body needs it in order to keep things running in a good way. Sometimes, the brain will completely adapt to the presence of benzo. Then, it will find it difficult to keep functioning without the drug. As a result, the user has now become addicted to the substance. Increased tolerance for Halcion can be a sign of addiction. A clear-cut sign of addiction is when the user experiences a mental attachment to the drug. Consequently, it causes them to act in ways they normally wouldn’t. For example, one might go ‘doctor shopping’ for an increased supply or the drug. Or one may buy the drug from illegal dealers. Blackouts, though rare, can be one of the more serious side effects of Halcion use. Therefore, this should prompt the user to consider stop taking the drug. Some users will report doing different things while under the influence. For example, they were driving, making phone calls and others. Then, they will not remember anything the following morning. Halcion can pass into the breast milk. Therefore, it may cause serious birth defects during pregnancy. They consider the drug dependency-forming and has a high potential for abuse. As a result, physicians usually don’t prescribe it for long term use. Withdrawal is a biological phenomenon that occurs with any form of substance dependence. You can recognize when one suffers from Halcion withdrawal. The user might not take the drug at the right time. As a result, it can serve as a red flag. Also, it should prompt the user to reassess their relationship with the substance. Consuming alcohol while on Halcion exacerbates the effects of the drug. This is why physicians recommend not to combine alcohol and Halcion. Of course, you can at least cut down on alcohol consumption while taking the drug. Habitual use of alcohol with Halcion is a sign of abuse. Halcion can negatively affect memory and learning. In many cases, no clinical evidence exists. However, certain doctors believe that benzos are in fact linked to the onset of Alzheimer’s disease and dementia. How Long Does Halcion Withdrawal Last? Withdrawal usually lasts for around five days to two weeks, given that it’s such a fast-acting, potent drug. Taking Halcion for a long period will extend the duration of withdrawal though. In addition, some patients have reported feeling withdrawal after using the drug for as short as two weeks. Using other drugs containing benzos will also result in a longer withdrawal period. The first 24 hours: Users encounter the first and most common symptoms of withdrawal. They include insomnia, increased heart rate and anxiety. 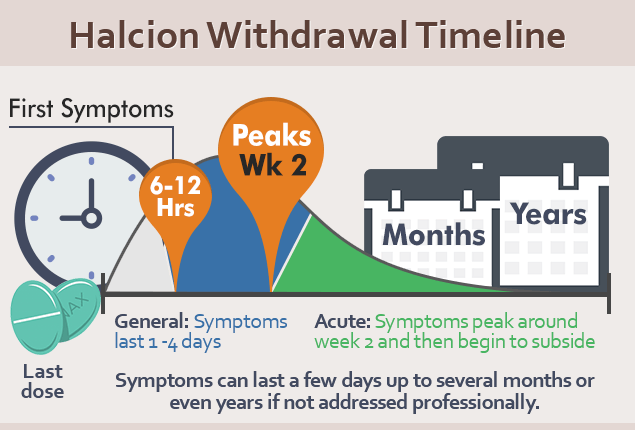 Day 1 and 2: Halcion withdrawal usually peak in the first 24h – 48h after last taking the drug. The user may have insomnia, increased heart rate, anxiety. Also, the user may encounter dizziness, trembling, muscle cramps and insomnia. Day 3 and 4: All the above symptoms start subsiding. In fact, if you haven’t slept until now you’ll probably fall asleep for the first time. This phase of withdrawal may have later for heavy users of Halcion. Day 5 to 14: Most symptoms have now tapered off quite a lot. Consequently, they will slowly continue to decrease until Halcion withdrawal has completely passed. Halcion withdrawal do not really mean a tapering-off in dosage. Users can have withdrawal symptoms even when going cold turkey. Your doctor will prescribe a lighter form of benzo (like Valium). This way, it will help your body adjust to a new balance more gradually. Do you find yourself at the crossroads of addiction? Do you have poly-substance abuse, and acute withdrawal symptoms? Then, you should seriously consider cognitive behavioral therapy (CBT). Rehab centers for Halcion addiction exist right across the US. Check here to find a center near you. Most rehab centers run programs for 30, 60, 120 or 180 days. In addition. many medical aid companies do pay for at least a part of the rehab program. Run, swim, do any sport you enjoy. This speeds up the healing process and increases dopamine levels naturally. When anxiety sets in, simply become aware of your body is reacting. Recognize this as a symptom of Halcion withdrawal and nothing else. Do something relaxing which will decrease your heart rate.